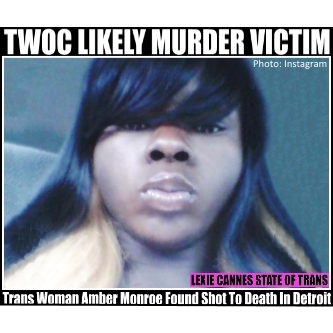 LEXIE CANNES STATE OF TRANS — UPDATE-1 August 9, 2015 — The director of Victim Services for Equality Michigan, Yvonne Siferd, has confirmed this death. See link below. 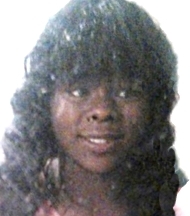 (Original article:) Verifiable sources are slim regarding the recent death of a trans woman in Detroit. However, Autostraddle is reporting that Amber Monroe was found shot to death. The source states trans rights advocate Cherno Biko is talking with Monroe’s friends and other people in Detroit. At this point, this is all that can be confirmed. UPDATE-2 — As of Oct. 27, 2015, police are still looking for a suspect. Although there are “press releases” and postings on social media, in particular, Instagram, however, none of these provided a source and/or link. Indeed, the website of the LGBT organization in Michigan that supposedly distributed this “press release” made no mention of a trans murder in Detroit, nor did they make note of this death on their social media pages. Proper press releases contains contact names and other means to verify the information contained within it. Not another transgender person. I don’t care if the person is black, white, yellow or green. These are people just you and me. You have every right to live as any transgender person. Hey stop killing us! Too many martyrs! It seems as if the victims were anyone else but transgender women there would be protest marches nation wide. I guess the fact that we’re the least wanted of all the minorities, makes us the least needed. Therefor we don’t count when it comes to blood shed aimed at our community. I am not only talking about the trans women of color either, but all trans women and all trans men. We are still humans and one of us is hurt or killed, that action is aimed at all of us. Because any of us could be next, yea, any of us in the transgender community could be injured or killed just for being ourselves. That, my friends is not equality! That is oppression. When a group of people are afraid to leave their homes, denied housing, employment, and health care for being themselves. They are oppressed. That is un-Constitutional, illegal, and if you want to go there un-American.